The DeVilbiss D100 Nasal CPAP Mask With Headgear masks offer a cost effective mask solution for your CPAP machine and provides the wearer with optimum flexibility and comfort. Available in both a nasal and full face design, the DeVilbiss D100 Nasal CPAP Mask With Headgear feature a moulded silicone cushion and are lightweight and comfortable to wear. Well-fitting masks increase the compliance of treatment and the overall effectiveness in the improvement of Sleep Apnoea symptoms. The D100N nasal mask and D100F full face mask are available in three sizes and can be adjusted using the headgear strips for an optimum fit. 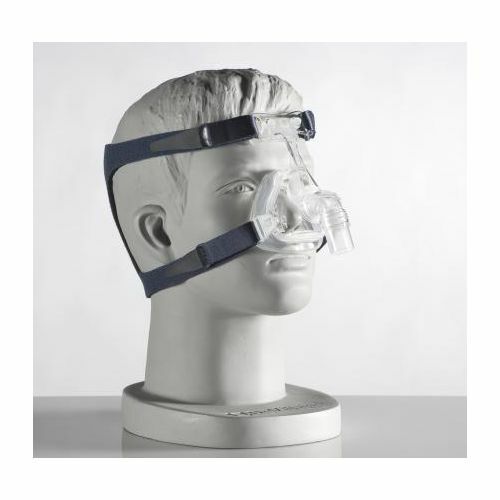 The tubing attachment on the DeVilbiss D100 Nasal CPAP Mask With Headgear has a 360 degree swivel with allows the user to adjust the tubing according to their preferred sleeping position, and the mask can be easily removed by unhooking the headgear from the mask frame. The mask should be cleaned after every use. To clean, simply detach the headgear and clean the mask components with warm water and mild detergent. Rinse all components thoroughly and leave to air dry. The D100 mask frame can be cleaned in the top rack of the dishwasher. Lightweight and comfortable to wear, the D100 Series of CPAP masks offer cost effective flexibility and comfort to the wearer. If you have any questions about the D100 Series of CPAP masks please contact Sleep Apnoea Services on 020 7720 2266.